I grew up just a couple blocks from the water in Virginia, so I'm used to hurricanes and flooding and big storms. So moving to Richmond a few years ago it was interesting to see how other people prepare. Luckily for us, the storm has moved on up the coast, and left us with little more than some heavy rain. Good sleeping/sewing weather! 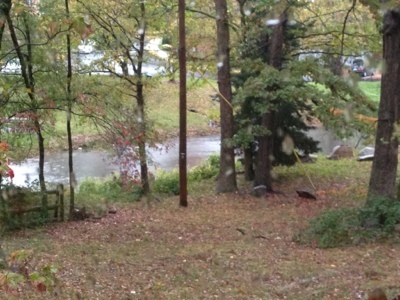 I was a little worried that the creek behind my house would fatten up some, but it looks ok. I didn't even lose power! Thank goodness! My thoughts and prayers are with those who live up north! I hope everyone is safe and dry!